Cryptocurrencies have been slowly but steadily working their way into the online gambling industry in recent years. So far, online casinos have been using cryptocurrencies (namely Bitcoin) predominantly as a payment method, which has significant advantages for players. However, there’s a new project that goes beyond the narrow scope of player payments and aims to move the entire gambling industry, including the games, random number generator, and player banking, onto the blockchain. It’s called FunFair. FunFair strives to achieve a decentralized transparent network that would eliminate the doubts that have existed in players’ minds since the beginning of online gambling. Let’s take a closer look at what FunFair is and how it plans to take away the need for player trust in the online casino industry. 1.2.1 How Are FUN coins used? 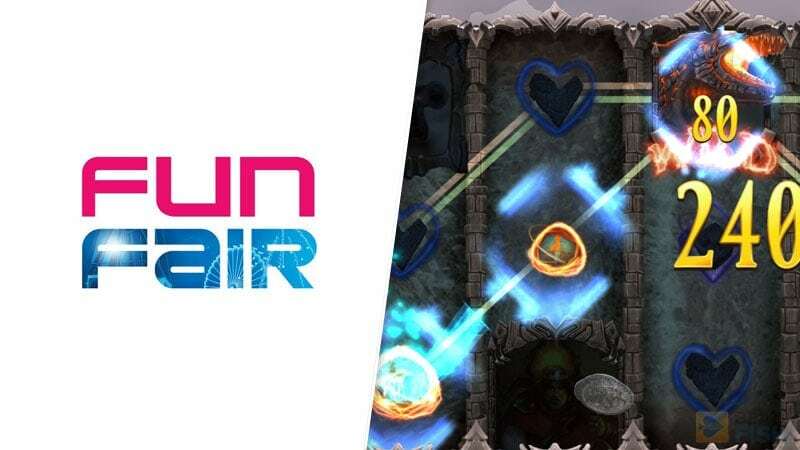 FunFair is a decentralized platform that uses the Ethereum blockchain, proprietary Fate channels, and smart contracts to deliver gambling solutions that are provably fair, but also fast and secure. FunFair is not an online casino. Instead, they develop the technology necessary to start an online casino and provide it to anyone who wishes to do so. This includes the platform, the gambling apps, as well as the currency. 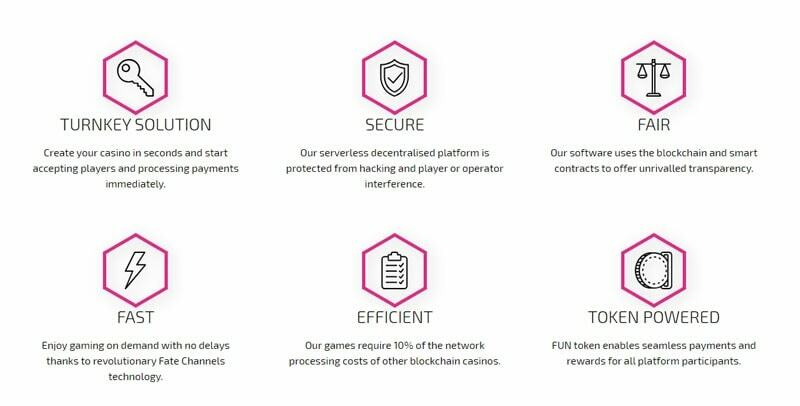 FunFair provides use case benefits not only to players, but to prospective casino operators who want to deploy a blockchain-based system. FunFair offers the platform completely for free hosted on the Ethereum blockchain, which eliminates the usual costs associated with hosting an online casino. On top of that, they promise almost instantaneous transactions and much faster gameplay. The FUN token is the native cryptocurrency of the FunFair system. 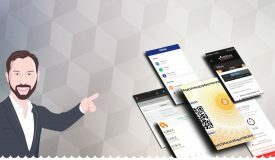 It is used for payments related to all aspects of the FunFair platform, including betting, payouts to players, license fees, and stakeholders’ compensations. The FUN token is pre-mined and located on the Ethereum blockchain. This means that all of the FUN coins have already been created in a single event and no additional ones will ever be created. There are approximately 11 billion FUN tokens in existence, distributed among the founders, purchasers, advisors, or held in cold storage. FunFair’s FUN token is used for all transactions on the platform, which bolsters security and improves speed. Initially, 17 billion FUN tokens were created in June 2017, 11 billion of which were sold during the Phase 1 presale. The Phase 2 presale never took place due to regulatory, commercial, and legal considerations, and the 6 billion surplus was burned. Currently, the FUN coin is valued at $0.0154587586. How Are FUN coins used? Players can buy FUN tokens from a large number of third-party cryptocurrency exchanges, such as BitFinex, Binance, OkEx, and others. To start playing with FUN tokens on a FunFair-powered casino, players first need to buy Ethereum coins. After that, they can exchange them for FUN coins and store them in an ERC-20 compatible wallet, such as MetaMask or Myetherwallet. After that, the gambling is done directly from your wallet; you do not need to actually deposit your money with a casino. This way, the transactions are much faster, you can start gambling the moment you register, and your funds are safe if a casino becomes insolvent or attempts to defraud you. Currently, CasinoFair is the first and the only brand to go live on the FunFair blockchain platform. In their whitepaper, FunFair illustrated in a graphic from the UK Gambling Commission annual report for 2017 that players’ trust in online gambling is on the decline. FunFair markets to online casino operators by offering lower operating costs and games that don’t require trust from players. FunFair aims to change that by delivering a transparent and decentralized platform, based on a provably fair technology. They aim to reverse the trend of eroding player trust. 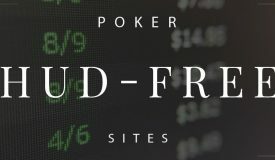 Even though the number of untrustworthy online casinos is relatively small, instances of cheating and fraud quickly become high-profile cases, which harms the reputation of the industry as a whole. On FunFair’s blockchain-based casinos, players will be able to verify that the games run fairly. This is achieved through a transparent RNG system, as well as with blockchain smart contracts, which provide a verifiable game logic. At the moment, all traditional online casinos require you to make a deposit and move money to their platform before you can play, even if you’re using cryptocurrencies. In many cases, when a casino becomes insolvent, player funds are lost forever. By playing on FunFair casinos, you make bets directly from your cryptocurrency wallet and so you never lose control of your coins. Some of the main advantages FunFair has over the traditional online casino format. Before each gaming session takes place, both players and the casino need to send funds into an escrow, which ensures that the player will be paid every single time. This applies to wagers of any size, which isn’t always the case with traditional online casinos. They do not always have funds ready (and are not always required to), so you aren’t guaranteed to get paid out for every single winning wager. FunFair utilizes several unique features that put it far ahead of the competition. These include Ethereum smart contracts, transparent RNG, HTML5, Fate Channels, and more. Let’s take a closer look at why these technologies are important and how they contribute to the bigger picture. FunFair significantly lowers the costs of running an online casino since it operates on the Ethereum blockchain, without any need for central game servers. Players see a lot of benefits from this as well because their safety is ensured due to the peer-to-peer system. In traditional online casinos, random numbers are generated by the casino’s Random Number Server. These servers are usually reviewed by third-party auditors, but other than that, players have no means of ensuring that they are running fairly. FunFair generates random numbers by combining random numbers from both the player and the casino. These are generated in real time and so the outcomes are provable and eliminate the possibility of fraud. 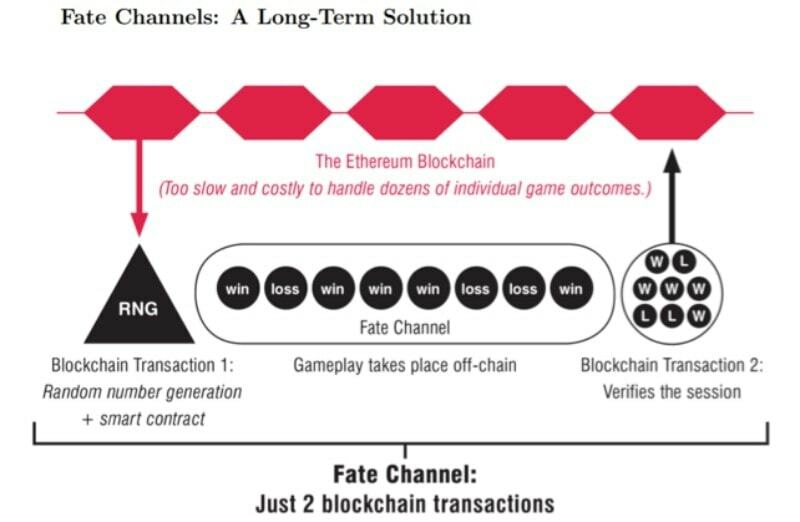 Fate Channels are a version of state channels developed by FunFair to solve two Ethereum-related issues: transaction fees and processing times. The Ethereum blockchain has two disadvantages that make it difficult for online casinos to operate on this platform. The first one is high transaction fees compared to other payment options and the second one are long processing times. FunFair developed Fate Channels, which are a version of state channels and solve both of these problems. This is a state channel opened during the gaming session. Instead of performing transactions after each hand, only two transactions are completed at the beginning and the end of each session. FunFair is a promising cryptocurrency project that has had a successful ICO (Initial Coin Offering) and addresses several problems inherent to online gambling. At the moment, FunFair focuses only on casino games, such as slots, roulette, baccarat, blackjack, and other table games. However, there are hints that in the future the technology would spread to incorporate other forms of betting, such as poker, as well. FunFair produces a range of casino games, which are available for real-money play right now on the Demo platform using FUN tokens. After watching a number of gambling-related cryptocurrency projects turn into vaporware without a working product for players, I’ve been encouraged at how far FunFair has already gone. 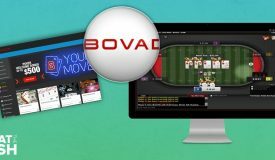 They have a working online casino offering games right now to players and they’ve consistently hit their roadmap milestones. I reached out to Sam Wright, Marketing & PR Manager at FunFair, to see if he could help me dig a little deeper on FunFair’s goals. Josh: Sam, I’ve long thought that blockchain technology is almost too perfect for online gambling. A transparent system that eliminates trust, ensures players get paid out, and makes sure the games are run fairly. There are a number of blockchain projects in development specifically for the gambling market, but they tend to focus on casino games, sports betting, or esports. What about poker? 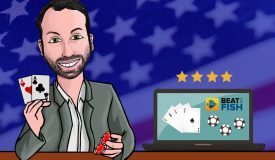 Is FunFair planning to support player-to-player poker? Sam: Blockchain really is an open goal when it comes to online gaming. 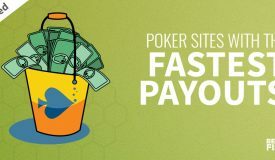 Its benefits of fair and transparent random numbers, instant payouts, and player protection when it comes to custody of funds are major advancements on what traditional online casinos can offer. In terms of the scope of its use across different betting verticals, we have focused solely on casino gaming for now, utilizing our Fate Channel technology to ensure a seamless partnership between house and player. Sports betting, poker, and esports offer differing challenges for the blockchain for the time being, but that’s not to say they’re insurmountable in the future. As ours, and partners blockchain tech develops, two-party player-to-player poker seems like of the more likely fits for it. The existing games offered by FunFair already look better than most games offered by existing online casinos. Josh: That’s great to hear. I want to talk about FunFair’s solution to the centralized RNG. Any form of online gambling, whether it be slots, blackjack, or online poker, is entirely dependent on the random number generator (RNG). The games can’t be fair if the shuffling isn’t fair. Every online poker or casino site that’s ever existed has been accused of having an unfair RNG by a vocal segment frustrated players on the wrong end of a bad beat. Up until now, players have had to take the word of online gambling operators and licensing agencies that the RNG is running fairly. I’m really interested that FunFair says it has a transparent RNG for provably fair games. How does that work? How can players ensure that they’re getting a fair deal with FunFair-enabled games? Sam: Across casinos, poker, and any form of gambling, there will be a minority of operators who choose to hide behind private servers and manipulate what should be a fair process in their favour. Obviously, the vast majority are acting in accordance with laws and regulatory requirements, but we go beyond this in delivering the most provably fair RNG procedure in the industry. 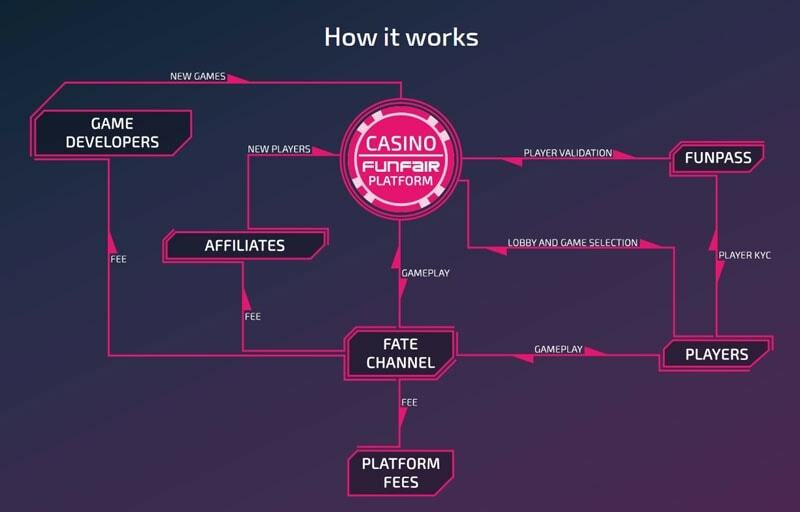 Gaming sessions at FunFair-powered casinos see both player and house each commit a large number of ordered RNGs to the Fate Channel. These are then combined to ensure half comes from each, mitigating the risk of either party tampering with the final number. It’s impractical and pointless for either player or house to attempt to alter the RNG they provide as they do not have access to the other sides, and therefore, all numbers will stay truly random. If players require further proof, they can check using the FairChecker tool in game or in their account history. At the close of a session, these are then hashed to the blockchain, with players able to view previous game sessions on it, giving players the peace of mind that all was as it was. Depending on their knowledge of code and the blockchain, they can interrogate it down to the detail they require. 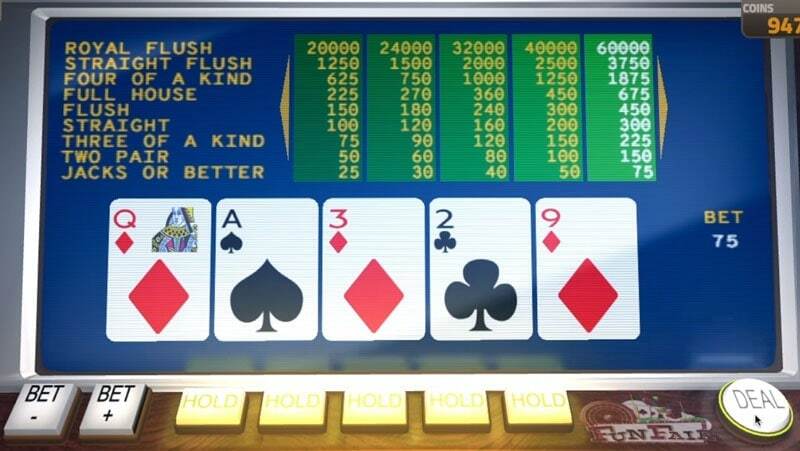 Every game played on the FunFair platform, such as video poker, is settled on an Ethereum-based smart contract, so winnings are automatically distributed to players. Josh: I’ve played in your showcase casino and it looks like you’re ready to go with casino games. 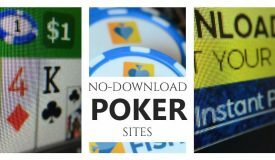 Are you planning to try to attract players directly to your hosted casino or are you looking more for other operators to incorporate your system, such as CasinoFair? Sam: We are a B2B business and so we’re looking for as many casino partners as possible. Our premium blockchain games are a great compliment to our platform and these are a major part of the appeal to prospective clients. CasinoFair is the first-generation working example of this and we’ll continue to use it as a learning tool and live trial of the technology. Over time, this will be superseded by client needs as they come aboard. Josh: Is it feasible for existing established operators in online gambling to incorporate FunFair? Sam: Yes. We appreciate established operators have different priorities and that their existing operations are very resource heavy, but the FunFair platform can offer a low-cost, diverse revenue stream that opens them up to a vast new audience. Significantly, our market research suggests, along with the wider crypto community’s behavior, that they have a propensity to gamble, and therefore, could be lucrative to those who commit early to our platform and blockchain in general. 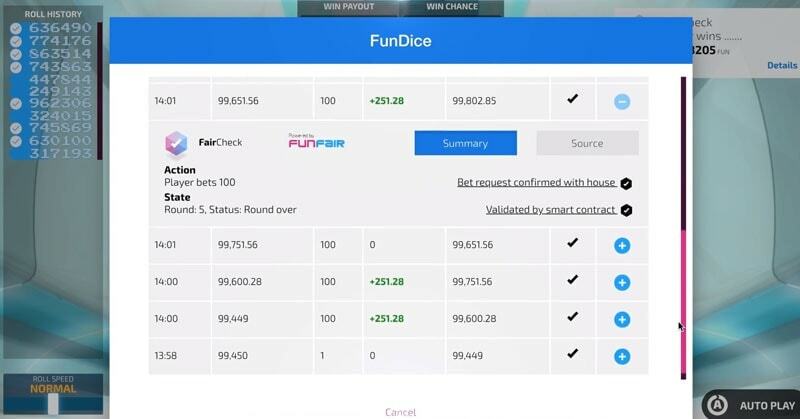 A look at the provably fair results at CasinoFair, which is one of the first implementations of FunFair on a live casino. Josh: Will players from the United States eventually be able to play on FunFair casinos? Sam: The online casino market in the US is a complex one and we’ll definitely keep an eye on its trajectory in the coming months and years. There’s been encouraging signs when it comes to their relaxation of regulation in sports betting and we hope this will translate to elsewhere. Our platform is an open goal for what regulators are looking for, we’re open to work directly with them and we want to give players a fair deal, so as blockchain adoption continues and the demand grows, I’d like to think this will be possible at some point in one of our later phases of rollout. Josh: One privacy concern I have for players is in the FunPass system, which I know is a KYC system new FunFair players have to go through once. What type of information do players have to give? Sam: Compared to existing KYC procedures where operators request unnecessary information, usually as a need to market directly to you and often without requiring permission to do so, our FunPass is far less onerous and much more streamlined. We only require that you are who you say you are and that we can validate your current address. Using progressive identity platforms such as Yoti, we can acquire this information once, verify its you, hash the FunPass once accepted to the blockchain, and then you’re free to play at any FunFair-powered casino. This one-time process respects your privacy and although a small but necessary amount of data is held on a private server for legal purposes, the only data held on the blockchain is the FunPass acceptance of the crypto wallet. Josh: That sounds a lot better than some of the KYC hoops traditional online casinos force onto players before they can get withdrawals. To finish up, what’s the next big milestone you’re hoping to hit with FunFair? Sam: After a successful launch of our direct to consumer project CasinoFair, we’re looking to hone our marketing capabilities around this and further improve the onboarding process and user experience in time for our launch of our first external partner, RakeTheRake. We’ve shown the platform works, we’re seeing encouraging traffic and stable Fate Channels, and now we want to prove this is a shippable product for the masses. This milestone will pave the way for a faster rollout of many more casinos over the coming months. Josh: I like the direction you’re headed, Sam. Thanks for your time.